The number of children who came to the EU and Norway unaccompanied, i.e. without a parent or another adult responsible for them, to seek asylum, reached unprecedented levels between 2014 and 2017, at almost 220,000. At the same time, at least another 48,500 unaccompanied children arrived during the same period, and did not seek asylum. Where did these children come from and which European countries received them? What approaches were taken to address their situation, once their status was determined? Under what circumstances are such children returned to their countries of origin? And what happens to them, once they reach the age of 18? 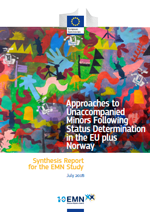 The wide-reaching EMN study Approaches to Unaccompanied Minors Following Status Determination in the EU plus Norway covering 25 Member States and Norway, sets out to answer these pressing questions. The EU-wide study aims to explore the situation of unaccompanied minors who, following status determination, are entitled to a residence permit or issued a return decision, and the approaches put in place by the EU Member States and Norway to ensure their integration or (voluntary) return. The study also examines how Member States deal with unaccompanied minors who cannot be returned immediately, or who turn 18 years and cases of unaccompanied minors’ disappearances. The study covers the period 2014-2017 and aims to follow up on previous EMN work on unaccompanied minors. Comparable data is provided.